1972-73 Idaho Inspection Sticker - $20.00 : Bob Hoyts Classic Inspection Stickers, Add a Final Touch to your Restoration! 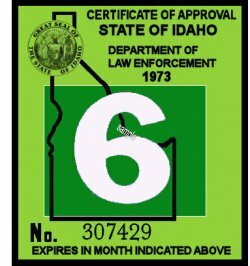 This 1972-1973 Idaho inspection sticker was digitally restored and reproduced both front and back. It has our patented "Peel and Stick" format allowing it to be affixed to the inside windshield. Issued 1n 1972 it expired in 1973. Buyer will receive a random month unless otherwise ordered.